Interview with historian and Alfred Russell Wallace scholar challenges evolutionary biologist, Dr. Jerry Coyne. That’s not how I remember this history, so I decided to check with Wallace biographer Professor Michael Flannery. Alex Tsakiris: All this might seem like a lot of minor detail that no one cares about, but this little bit of history is actually quite important in the culture war debate over the theory of evolution. Why does an otherwise smart guy like Dr. Jerry Coyne say these things which are so obviously incorrect? What’s the real agenda here? Professor Flannery: Well, my guess is that he is either just unfamiliar with Wallace’s work, although that’s kind of hard to believe… I actually think that it just doesn’t serve his purpose. When you look at his book, Why Evolution is True, one of the things he’s writing against is Intelligent Design. To bring Wallace into the picture becomes problematic for him because Wallace himself came to view evolution as being guided. Welcome to Skeptiko, where we explore controversial science with leading researchers, thinkers, and their critics. I’m your host, Alex Tsakiris, and on this episode of Skeptiko I have a short follow-up interview with Professor Michael Flannery from the University of Alabama, Birmingham. 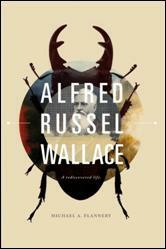 He’s the author of Alfred Russel Wallace: A Rediscovered Life. Now you’ll recall that at the end of the last episode of Skeptiko I told you I was going to do this interview because when we were talking to Dr. Jerry Coyne during the last interview, he had a number of things to say about this relationship between Darwin and Wallace, and in particular about whether or not Alfred Russel Wallace ever connected biogeography to evolution. This sounds like a little bit of inside baseball and detail-oriented stuff that you may not care about in the bigger picture of science, but it turns out to be pretty central to this culture war debate surrounding the theory of evolution. Alex Tsakiris: So I’ve managed to get Professor Mike Flannery on the phone here and Professor Flannery was nice enough to actually review the interview that we had with Jerry Coyne when I sent it to him. I thought there were some kind of direct points about the Darwin versus Wallace thing that he certainly knows a lot better than I do. I thought we’d have Professor Flannery back on here. Mike, thanks for joining me. Alex Tsakiris: So just a couple of quick points here. I feel first of all that we have to frame this up. Dr. Jerry Coyne says, “Where was I wrong? You tell me where I was wrong.” So I feel we have to oblige Dr. Coyne in that regard. Where I want to start, because I think he describes you as not a Wallace scholar but as an Intelligent Design Creationist and I think when someone does that, which he does and kind of slips into this other mode, that’s not really at all even scientific. I resist even calling him a biologist although he is trained and he has a Ph.D. in biology. He is just purely coming at it from an Atheist perspective. He’s calling you a Creationist. It’s funny to me because when we started our discussion, our interview on Skeptiko, we kind of joked. I asked you how many dinosaurs fit in Noah’s Ark and we were kidding about how all these discussions just quickly degrade into these silly kinds of attacks and yet here he is with the Creationist thing. What did you think when you first heard that? Alex Tsakiris: Let’s go over it a little bit. I think you, as you demonstrated in your book and your interview with me, have an extensive knowledge of not just Wallace but of many, many of the Darwin scholars, Darwin biographers. You impress me as someone who’s quite well read and published on this topic. So to call you a Wallace scholar I think is pretty accurate. Professor Flannery: Well, I thank you. I think the book has a real contribution to make and I’ve spent a considerable amount of time studying over the past four or five years Alfred Russel Wallace. If you look at the book, Alfred Russel Wallace: A Rediscovered Life, it has well over 200 references in it and it’s thoroughly documented. Again, I would just say I believe the book will stand on its own merits. Professor Flannery: Well, that’s actually in my written reply that you so kindly allowed me to present and I assume will post. That goes to the essential heart of the matter of my disagreement with Dr. Coyne. He seems to really be unfamiliar with Wallace’s body of writing on that topic. As I point out, Wallace himself actually pointed out that this is not just a matter of applying some arbitrary divisions of the earth that might be useful to the zoologists but in fact it’s a fundamental problem with the Theory of Evolution. His two-volume work, The Geographical Distribution of Animals, which he published in 1876 was written specifically to address that. Now if that’s not using biogeography as evidence for evolution, I don’t know what it is. Let’s be quite clear that Wallace’s reputation as a biogeographer extends beyond the seminal work in that field, and that’s the one I just mentioned. His work dates back to 1852. Professor Flannery: Again, he’s referring to The Geographical Distribution of Animals, which is the magnum opus in the field. There’s no doubt about it but actually the very first paper was actually a work that Wallace read before the Zoological Society of London. He actually read it in December of 1852. It was a paper called, “On the Monkeys of the Amazon,” and he was then just beginning to be looking at geographical distributions of various species. And that, of course, a much more important work. This is 1852 so this is well before 1859, the first edition of Origin of Species, okay? Then in 1855, he writes during the rainy season and he was on the island of Sarawak and he writes a paper called, “On the Law Which Has Regulated the Introduction of New Species,” that actually appeared in the annals and magazines of Natural History. It appeared in September of 1855. He actually applied the geographical distribution of animals in the Malay Archipelago, which is where he had been spending a considerable amount of his time. In fact, he spent a total of eight years there. He was applying the geographical distribution of animals in that region to evolution. Alex Tsakiris: So we have him reading a paper in ’52, publishing a paper in ’55. This is even before The Origin of Species. But let’s get to Coyne’s exact point. So he’s saying not until 17 years after when he published his two-volume work. He never made the argument that biogeography itself is evidence for evolution. Where do we have evidence like you presented in your written paper that was published that not only did he make the case before then, but others acknowledge that his writings were very influential in this area. Now, that’s what McCalman says and he’s referring again to the Sarawak Law paper which used geographical distribution as really an essential part of his argument. Alex Tsakiris: When Coyne says that “Wallace basically used Darwin’s ideas in his later book,” what we really have is the exact opposite of that, right? So we have them both exploring this idea but the first one to publish on this area in terms of biogeography and evolution is clearly Wallace, correct? Professor Flannery: That’s why I think you even made reference to the president of the International Geography Society who actually referred to him as the Father of Biogeography. Now Dr. Coyne wants to say that he acknowledges that Wallace is the Father of Biogeography but then he steps back and says he wasn’t using it to explain evolution, which seems like a non sequitur to me. The reason they call Wallace the Father of Biogeography is not just for his The Geographical Distribution of Animals, but for that whole body of writing that I just alluded to. I guess we’ve handled that so convincingly that I don’t know if we need to have you regurgitate the same thing, but I guess I’d use it as a bridge to this other thing. How the heck can he say this kind of stuff and why does he say this stuff which is so obviously false and incorrect? What’s the real agenda going on here? Professor Flannery: Well, my guess is that he is either just unfamiliar with Wallace’s work, although it’s kind of hard to believe that for anybody that’s been in the field as long as he has. He certainly would probably be aware of the body of work that Wallace contributed. I actually think that it just doesn’t serve his purpose, which his over-riding purpose is really, in my opinion as far as I can tell, when you look at his book, Why Evolution is True, one of the things he’s really writing against is Intelligent Design. And to bring Wallace into the picture becomes problematic for him because Wallace himself came to view, particularly in his later years, evolution as being guided. It’s what I call in my book, “intelligent evolution.” Yes, there’s common descent but it is detectably designed and guided. Alex Tsakiris: But hold on, Mike. We know why that matters so much–because it’s such a hot cultural war debate. But inside of this narrow discussion is the way we framed it up. How can that possibly matter? Why should that matter? You’ve just presented clear evidence of a misrepresentation of the facts. That’s my opinion. Those are my words, not yours, so I don’t want to hang you on that. But that should not matter when we’re just talking about history, when we’re talking about reading what you and other scholars have written. Can’t we just cut through that and read what they really have said? Professor Flannery: I would hope so. The idea behind history is to get a full picture of the cast. One of the reasons I wrote the Wallace book was to really give a fuller picture of the breadth of contributions that Wallace made, not only in various aspects of evolution but how in many ways the kind of intelligent evolutionary scenario that Wallace actually sketched out has tremendous impact, as you put it, in the ongoing contemporary debate today. So I would like to think that we would take a full look at that picture. That’s what history is all about. That’s one of the benefits of having a historical understanding and not the telling a partial story or a one-sided story. But you know, quite frankly, Wallace has always in effect—even the title of Michael Shermer’s book, In Darwin’s Shadow, Wallace has been struggling against Darwin’s shadow since his death in 1913. So again, the idea behind my book was to shed a little light on Wallace and in my opinion Jerry Coyne’s book, all it does is cast a darker shadow on something that we’re trying to understand a little better. Alex Tsakiris: Well, thanks Mike, thanks for jumping in here and clearing up a couple of those details on the Wallace versus Darwin understanding of history. Thanks a lot. Professor Flannery: You’re welcome, Alex. Thanks again to Mike Flannery for joining me today on Skeptiko. I’ve also published the written response that Professor Flannery did. That’s on the website; it’s a link right below the show notes. Please give that a read. Very interesting stuff there. I’m also going to post in the forum an interesting email exchange I had with Roy Davies, author of The Darwin Conspiracy. Interesting book from someone who’s looked extensively at some of these Darwin-Wallace issues. You know, one thing to add on this debate issue between Dr. Jerry Coyne and myself in the last episode of Skeptiko is, I know I came down on Dr. Coyne pretty hard at the end of that last show, but I think there’s so many scientific points that were laid out there that were just left unaddressed that I felt like those needed to be brought to the table. And I’d go one step further and say I’d love to have a follow-up debate with Dr. Coyne, anytime, anyplace. If he doesn’t like the format or he doesn’t like me hosting the debate, I’m sure we could find any number of skeptical podcasts that would be willing to host such a debate. The important thing is that these scientific issues be debated. Since the central argument from Jerry was that he wasn’t able to adequately prepare for the last debate we had, I think that should be easily resolved just by time. I mean, if we were able to get back together, I think there should be no excuse for him not responding to, for example, the self-directed neuroplasticity claim of Dr. Jeffrey Schwartz, which we all agree seems to be central to the question of evolution. Or whether or not quantum effects have ever been observed in biological systems. That’s another question we could debate. Or whether quantum effects have anything to say about materialism. That’s one of the other topics we could hit. There’s any number of topics that we could follow-up on in a debate if Dr. Coyne is willing to do that. So we’ll wait and see what his response is on that. Of course, if you’d like more information about this show or any of our previous shows, please visit the Skeptiko website. It’s at skeptiko.com. You’ll also find there a link to our forum. We discussed the last show at length. You can go in there and read what various skeptics as well as—I guess—proponents have to say. There’s also a Facebook link, a comment section, and a direct email link to me there on our website. That’s going to do it for today. I have this accelerated publishing schedule of every week that is going to continue for a few more weeks. I hope you can keep up with it. I have a lot of Skeptiko coming at you here but I hope you’re enjoying it. Take care. Bye for now.